Our Holiday Dragonfly 5 ***** DTV classification is of a size of about 80 square meters for your stay and is available for 4 people. and a child up to 5 years. The bright, comfortable living space 30 sqm, a modern fitted kitchen with integrated dining area is GSP. 2 armchairs, a sofa, flat screen TV / DVD and stereo invite you to relax. Bathroom with shower / WC, a walk-in shower access, hairdryer and cosmetic mirror. The apartment is equipped with granite and laminate bathroom with tiles. Insect repellent on all windows ensure a restful sleep. Private balcony and several cozy relaxation areas in the garden. Safe !!! WiFi !!! Between rest and joy of discovery, peace and enterprise you will find the necessary balance here. Our house is about 600 meters from the town center. With the bicycle trail and a forest with blue and cranberries, heath and meadow area are diverse excursion possibilities around the corner. The 11 amusement parks are also easily accessible by car. Architecture and modern zeitgeist combined with sonnenumspielten rest areas on a comprehensive approach, in which the artistic works in wood and metal between trees, shrubs, fruits, vegetables nd herbs are presented. Bicycles / for a fee are available for a trip. Bed linen and towels are included in the rental price. Each apartment has a safe, insect screens on the windows and free Wi-Fi. Utility room with washer / dryer / ironing board - u. iron / for a fee. In our owner-managed house you get lots of tips and offers for a fun-filled holiday. Sehr Modern eingerichtet , alles vorhanden , sehr nette Vermieter . Love holiday guests, welcome to our HOUSE 52 ° NORTH we offer two 4 u. 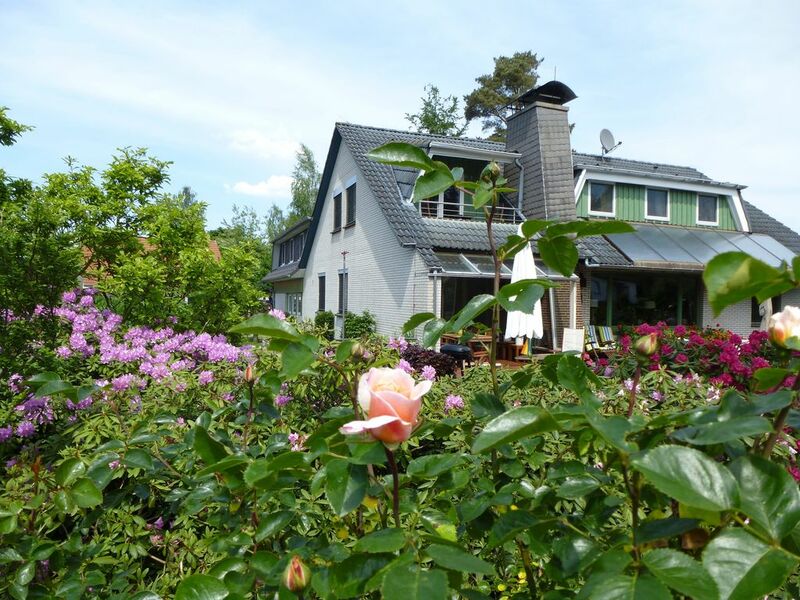 5 star apartments in Winsen / Aller on. continuous water surface of the Lüneburg Heath. Recognition as a nature conservation project of the Federal underlines the special importance for the conservation of partially untouched nature and many endangered animal and plant species. Bicycle trail is intended for a special experience. The heath rivers Aller Örtze and makes for unforgettable hiking water. Who wants to go fishing, also gets his money. During a visit to the Winser museum courtyard or in the windmill you learn a lot about the life of 'Winser' in times past to the Hüttensee in Meißendorf you can sail, surf and pedal boating and grounds of the lodge marine parks can be skills on a provide 18-hole miniature golf course to prove or take a dip in the lake. Winsen to explore from a bird's perspective. Celle (13 km) with its old half-timbered houses, museums, water park and trips to the zoo and amusement parks in the area.